Native to Africa, the Gemsbok Oryx is available to hunt year-round. These animals are a light brownish-grey or tan in color, with lighter patches around the rear. A long black stripe extends from the chin to the lower flank of each rear leg. Gemsbok are widely hunted for their spectacular horns, which average 33 inches in length. Male horns are perfectly straight with a slight outward & rearward angle. Female horns are longer and thinner with a slight outward and rearward curve. 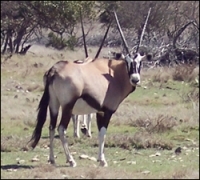 Gemsbok are one of the few antelope species where female trophies are sometimes more desireable than males.